1.Large capacity allows you carry most of daily stuffs you want. Great "double handles"design, you could easily move the duffel bag when you store too much things in it. 4.Fortified zippers,smoothly unzip;neat sewing; all of these make users get better experience,and make it last more years. 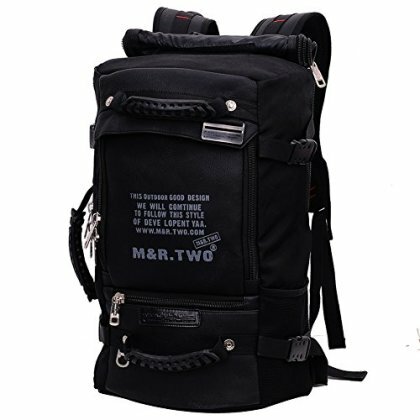 5.The back hidden design can easily change the laptop backpack into a messenger bag/crossbody bag/mail bag/shoulder bag. When unzip back zipper.it could be used as a expandable pocket. The travel backpack also suits for many occasions:outdoor,hiking,or hunting.To speak of that side holder could easily fix hunting gun.